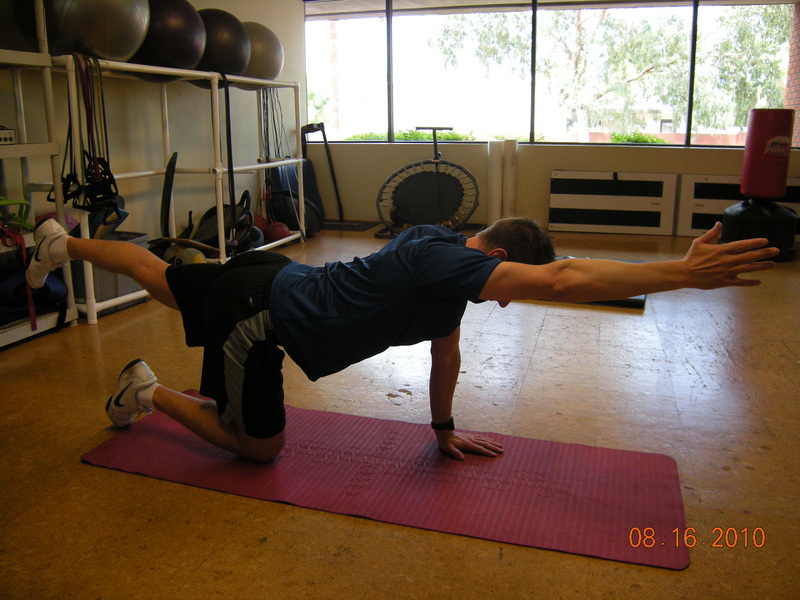 The Pointer is an exercise you’ll learn in my 4 part series “Reduce and Eliminate Low Back Pain” Seminars. It is a great exercise because it requires no equipment and it can be performed anywhere. The picture above is the Finish Position. The Start Position is so simple I didn’t bother to include the picture. To begin place each hand directly under each shoulder and place each knee directly under each hip. Your back should be parallel to the floor. From the start position pull your belly button toward your spine, without rounding your spine. Lift your right hand and left knee one inch off of the floor and hold for five seconds. Now slowly and simultaneously extend both your right arm and left leg. You should move very slowly. It should take four second to reach full extension (it’s actually flexion of the arm, but no reason to get too technical). Both your arm and leg should reach full extension simultaneously. Slowly return your arm and leg until your hand and knee are both one inch off of the ground again. This should take four seconds as well. Do not touch your hand or knee down. Keep moving slowly from the start position to the finish position until you’ve performed the desired number of repetitions. Repeat using your opposite arm and leg.